2007 07 Reg, Finished in gleaming white with contrasting cloth trim, 3 Seater cab, Electric windows, Radio/CD, Power assisted steering, Anti lock brakes, Traction control, Automatic/triptonic, Central locking, Isuzu alarm system, Fitted with a Hyva HA28 Hiab/crane with hydraulic stabilizers, 12ft Double dropside body with extra high sides and 1000kg Electric tail lift, Very Useful vehicle, Genuine 45,000 Miles with a full service history/maintenance print, Outstanding condition throughout must be seen and driven to be fully appreciated, All Vehicles supplied with New MOT/ Service and 6 Months warranty, Finance available, Nationwide delivery available, McGuinness Trading is located just 3 Miles From Jct 8 M23, 6 Miles Gatwick airport and 8 Miles Jct 6 M25, Viewing is strictly by appointment only. 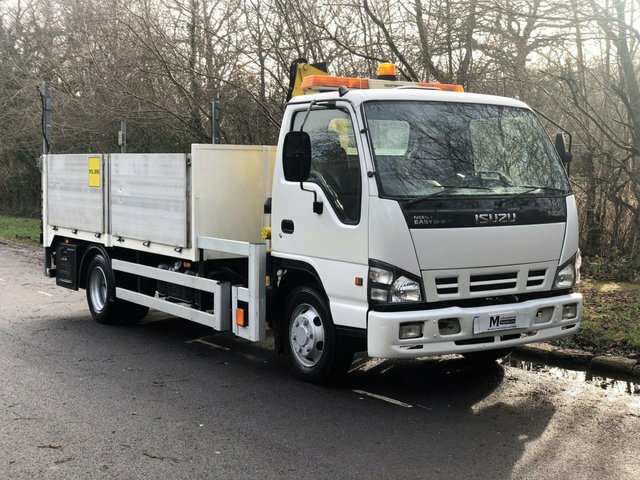 Get the best deal on a used Isuzu Trucks van for sale in East Grinstead by making your way to McGuinness Trading Ltd today. You will find every available model listed here on the website, and as all our stock is competitively priced you should have no problem sourcing a pre-owned Isuzu Trucks to suit your budget. Take the opportunity to browse our current range online before contacting a member of the showroom team to find out more. Our friendly and knowledgeable staff will be more than happy to answer any questions and provide advice and guidance when necessary. Alternatively, why not pay a visit to our showroom in person and take a closer look at the selection of used Isuzu Trucks models for sale.